Ms. Berardi earned a bachelor of science degree from St. John’s University with a physician assistant major. 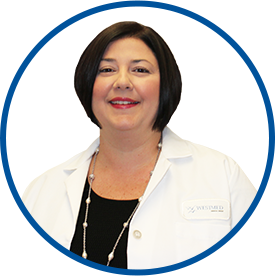 She has over 15 years of experience providing obstetric and gynecologic care, with four years as a physician assistant IVF coordinator. Prior to joining WESTMED, she was a surgical physician assistant in the Department of Obstetrics/Gynecology and Women’s Health at Montefiore Medical Center for 10 years. Previously, she worked as a surgical physician assistant in the Department of Obstetrics/Gynecology at Lenox Hill Hospital. Her experience as an IVF coordinator was with the New York Fertility Institute. Ms. Berardi is certified by the National Commission on Certification of Physician Assistants (NCCPA).